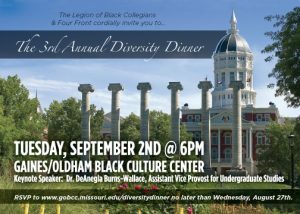 You are invited to take part in the Third Annual Diversity Dinner hosted by Four Front and The Legion of Black Collegians. This event will be taking place on Tuesday, September 2nd, in the Gaines/Oldham Black Culture Center with doors opening at 6:00pm. The connection that students have with Faculty/Staff is indispensable and something that we hope to strengthen in the years to come. For this reason, Four Front and LBC have teamed up for the Diversity Dinner. This year’s keynote speaker will be Dr. DeAngela Burns-Wallace, Assistant Vice Provost for Undergraduate Studies. We would like to extend this invitation to you and hope that you are able to attend to make this a memorable night for the students at the University of Missouri. RSVP is on a first come, first served basis as there are only 100 seats available . We are anticipating 40 seats for faculty/staff and 60 seats for student leaders. Please RSVP by Wednesday, August 27th. Any further questions or concerns should be sent to Jonathan McElderry at mcelderryj@missouri.edu. We look forward to your attendance!